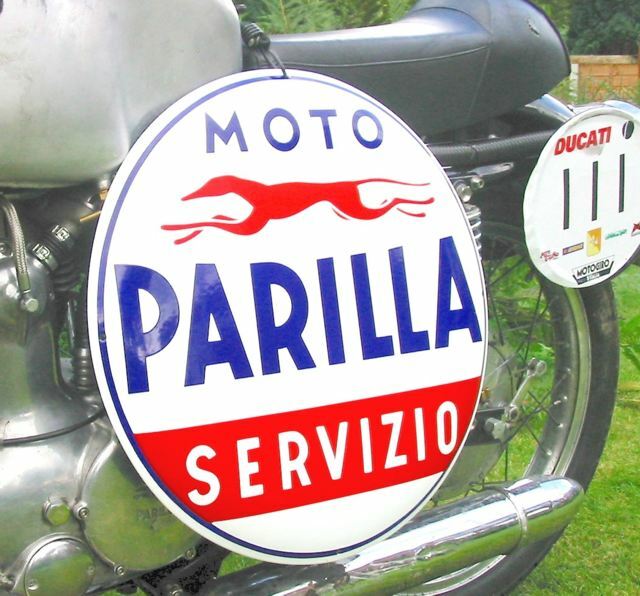 Not exactly a high priority when you have no piston for your engine but we are all partial to a nice period piece of art – which is what I take the Parilla Servizio dealer sign to be. A faithful reproduction of the original logo & script on a 3mm thick domed steel base. The logo & script are in vitreous enamel as the original was. This is not some cheapo screen print onto a thin bit of alloy sheet. Each sign weighs in at 3.6 kg 50cm diameter. A really nice piece of kit for the workshop wall. The price is £90 UK each plus P&P. UK by DHL next day – £30 for up to 3 signs. Before you ask, the PO is more ! USA by DHL “5 day” airfreight – £70 for up to 3 signs. Postage may different depending on destination – check before buying.